We love cooking food on the grill in the warm months – actually you’ll often find me on the patio grilling in the snow as well! One of our favourite foods to grill are hot dogs but our plain old hot dogs needed to be spiced up. I decided to put together a buffet of toppings to create some delicious gourmet hot dogs and my taste testers gave them all two thumbs up. 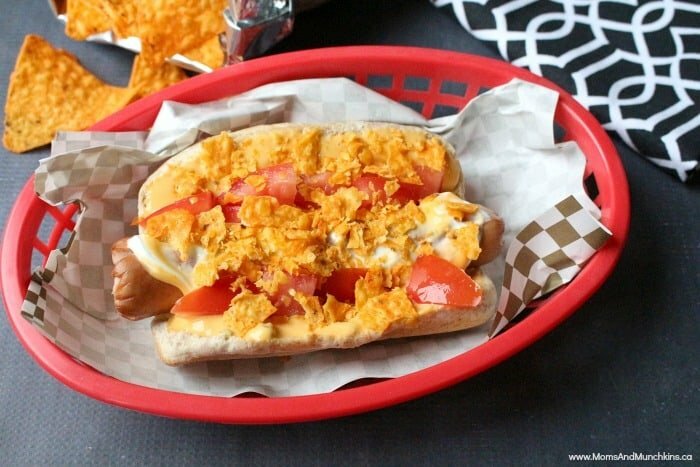 For this Nacho Average Hot Dog (Get it? Not Your Average! ), you’ll need nacho cheese dip, diced tomatoes, sour cream and crushed cheese-flavored nacho chips. 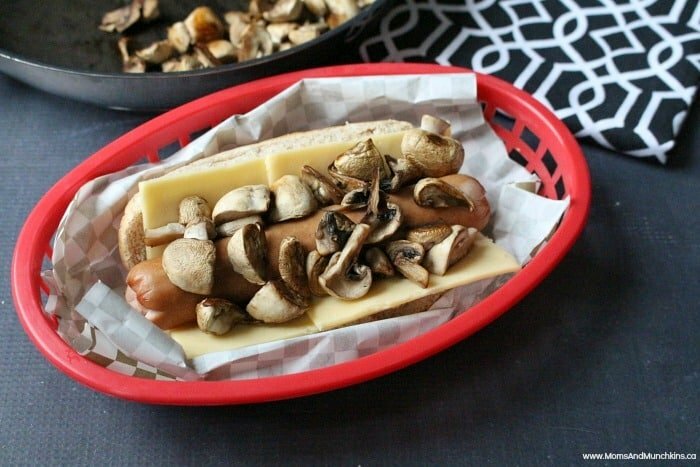 For this Mushroom & Swiss Dog you’ll need fresh Swiss cheese slices, sauteed mushrooms and ranch salad dressing. 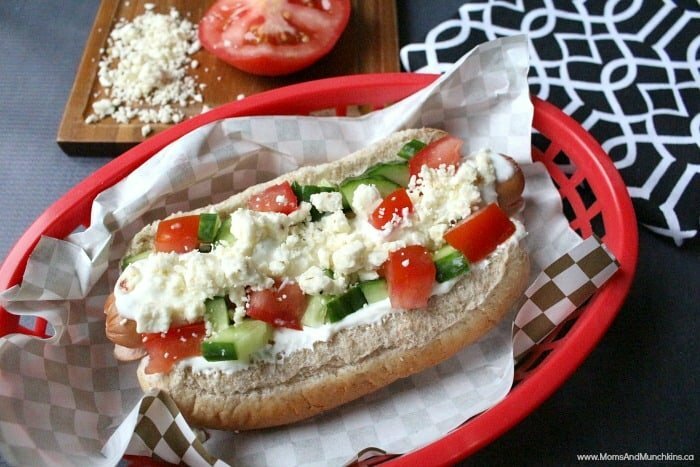 I absolutely love Greek food so this is the hot dog that I had to try for supper! 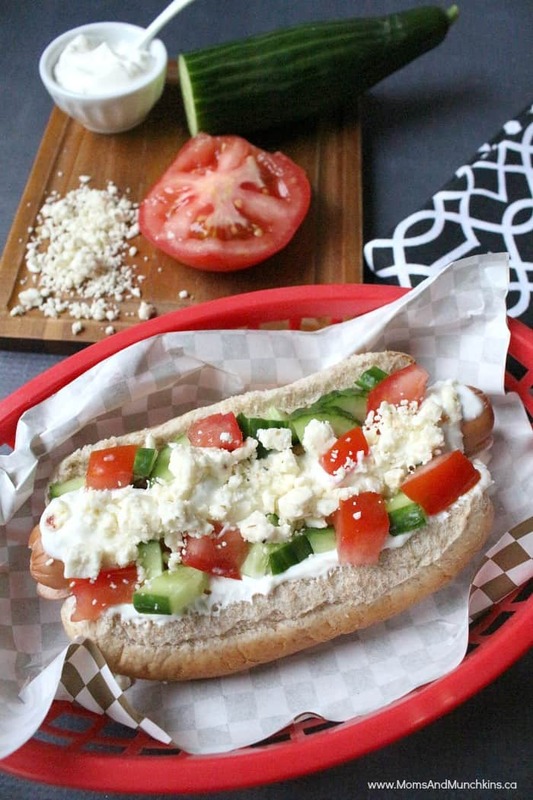 For this Opa Hot Dog you’ll need Tzatziki spread, diced tomatoes, diced cucumbers and crumbled feta cheese. I sure wish I had a piece of baklava for dessert after this hot dog! Out of the three gourmet hot dogs I made, this one is my favorite! 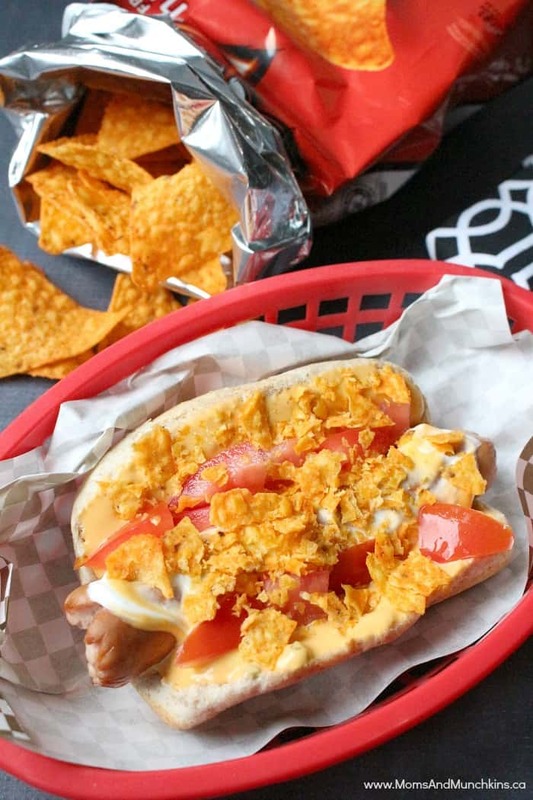 Another delicious idea for gourmet hot dogs is taking your favourite appetizer and turning it into a hot dog topping like buffalo chicken wing sauce, maybe a Cowboy Gourmet Hot Dog with BBQ sauce and onion rings…the possibilities are endless! Looking for a gourmet burger for your next BBQ party? 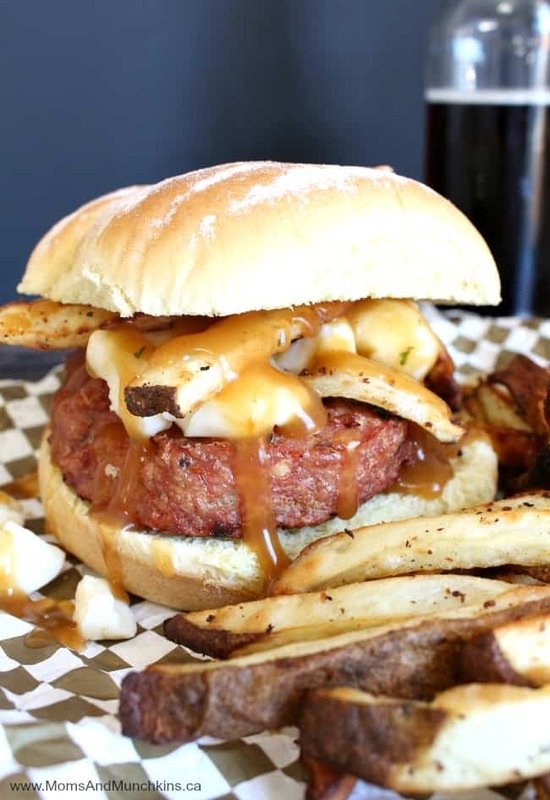 Check out this very Canadian Chicken Poutine Burger. Extra napkins required but worth every bite! What toppings do you want to try on a hot dog? Let us know in the comments below. For more delicious recipe ideas, check out our Recipes page. We’d also love to see you join our community on Facebook, Pinterest and Twitter. Be sure to say HI when you stop by! Thanks, Angie! My husband’s favourite was the Nacho Average Hot Dog. I still can’t believe he ate 3 hot dogs plus salad and chips! Oh boy! I hope you have a great week as well! My family would love these! Great idea to give more options for hot dogs. Three great ways to jazz up hotdogs!! Thank you for sharing at Simple Supper Tuesday. oh my, reading this before lunch is not good! 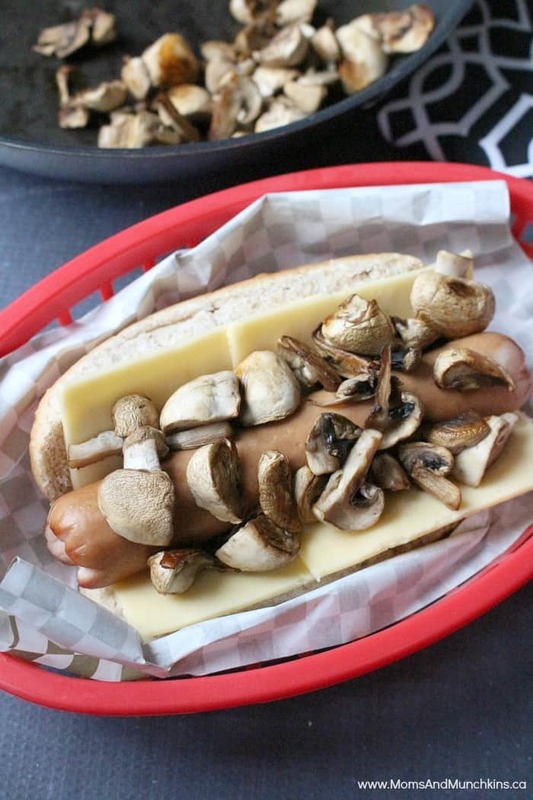 The mushroom and swiss dog please! Hi! Found you on Easy Living Mom link up. Love these ideas! We are having hot dogs for dinner tonight. I’m going to see if I have any of the ingredients in the house to make one of these tonight. Pinned and now following via twitter. I hope you enjoy them! My favorite was the Opa Hot Dog. Oooh. I’m all over that Opa Greek hotdog. 😀 Thanks for sharing on beColorful this week. OOhh, it was SO good! I hope you enjoy it!